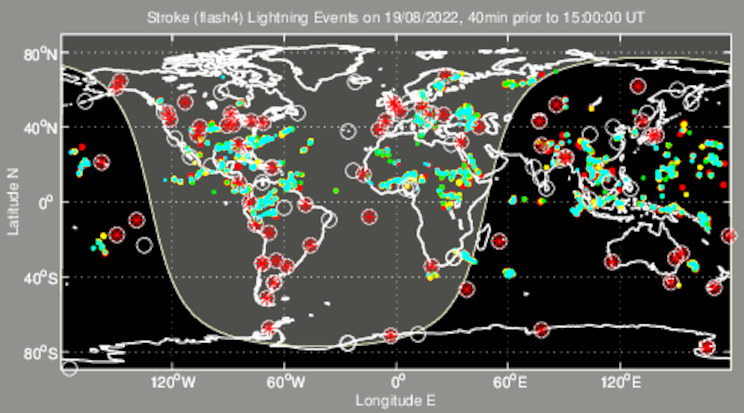 Lightning and the corresponding storm-noise it generates is the prime cause of noisy plots on this site; if there are ANY strikes within propagational range of central Pennsylvania (i.e. roughly speaking north-eastern US and Canada daytime, everywhere on the map night-time) reception will deteriorate. Typically, the first to go will be Lowfers, since their ERPs are so low. Part 5 stations being 20-30dB (or more) greater in ERP tend to still remain visible, but against a noisier background. DCF39 similarly - it will soldier on through almost regardless, but occasionally gets subsumed by the noise. A good guide is the brace of 'Loran' lines centred at 137.776kHz on the 'Part 5' plot; if they've become indistinct storm noise is bad enough to compromise reception and plotting of typical Part 5 / Lowfer signals. Oddly, close storms (meaning ones passing within say a 100 mile radius) are less trouble than distant clusters; local strikes tend to 'sound' as intense but discrete impulses, which ears and the FFT programs used here can ignore and 'listen through' more readily than the lower level but more continuous and decorrolated hash from distant storm groups. Really close storms tend to result in the plots freezing or going dark; that's because I've pulled the antennas, or unplugged the lot! Thanks for looking here - it means you are cognizant that storm noise is as dominant a feature of LF path performance as propagation itself. There is also nothing I can do about it! 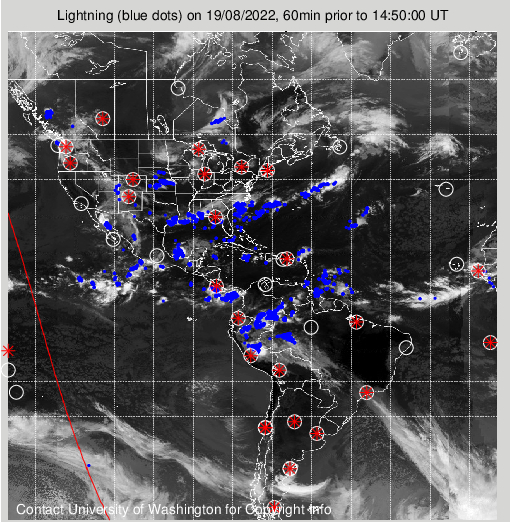 In contrast with the plot solely of the US from Lightningstorm.com for which there are links all over this website, the activity colours are reversed - blue represents the most recent strikes, red, the oldest.